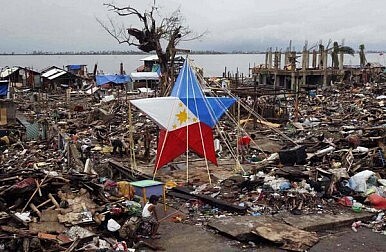 Survivors of Super Typhoon Haiyan (Yolanda) began Christmas preparations among the rubble, happy to be alive despite losing homes, possessions, and in some cases, family members. Christmas trees lined the streets of Tacloban, one of the worst-hit cities, with locals crowding into damaged churches and shopping centers. “Nothing can stop us from welcoming Christmas even though we have lost our home,” Ellen Miano, a resident of Tacloban, told AFP. Miano and her husband constructed a makeshift shelter from typhoon debris. The 6-by-10 foot shack, fashioned together by pieces of wood and sheet metal, houses Miano, her husband, and their four young nephews. The family was given a traditional Christmas meal, donated by a relief agency. A 20-year-old neighbor of the Miano’s built a 4-meter-tall lantern in the front yard of a family that died in the storm. “I made [it] to honor the dead,” he told reporters. The unemployed good Samaritan, who lost a dozen of his own family members, used his own savings to fund the project. “It made many of my neighbors happy,” he added. Temporary churches made from coconut trees and tarps welcomed displaced parishioners for pre-dawn masses that mark Christmas Eve. Archbishop Guiseppe Pinto, a representative of Pope Francis, arrived in Tacloban to spend Christmas with survivors. While church officials were concerned with finding a place for the archbishop to stay while visiting the devastated city, the archbishop was was quoted as saying “I will sleep wherever you sleep.” Pinto will deliver a Christmas morning mass at Tacloban’s Saint Nino Church. More than 90 percent of Filipinos practice Christianity. Though fewer than 10 percent of Malaysians are Christian, all of the country’s motorists can expect discounts at the tolls for Christmas and New Year’s Day. Several major toll roads, including the East Coast Expressway (ECE) and Guthrie Corridor Expressway (GCE) will offer discounts from 10 to 20 percent. The discount will be applied whether drivers pay by cash or with electronic PLUS cards. Four Malaysian “scientists” in George Town will be celebrating Christmas behind bars. The two men and two women were busted with nearly $200,000 worth of chemicals and drug processing equipment at two separate meth labs. Police also seized 1.9 kilograms of methamphetamine and 2.3 kilograms of heroin worth approximately $170,000. All four of the suspects tested positive for drugs and two have prior drug-related arrests. Drug offenses in Malaysia carry a mandatory death penalty.